I am very excited to say that I have finally finished the blanket that I started way back in January. I chose it because firstly, I wanted to get better at crocheting (I only learnt just before Christmas) and I find the best way to learn something is to repeat it. I have also been wanting to make a blanket for our sofa (a kind of sofa blanket in the winter/wraps around you and little one/could happily be thrown on the floor to make an island etc kind of blanket). I almost knitted one but I’m glad I didn’t as I think the crochet looks a lot better and after knitting a couple of shawls, I didn’t want to use really long needles for a while. 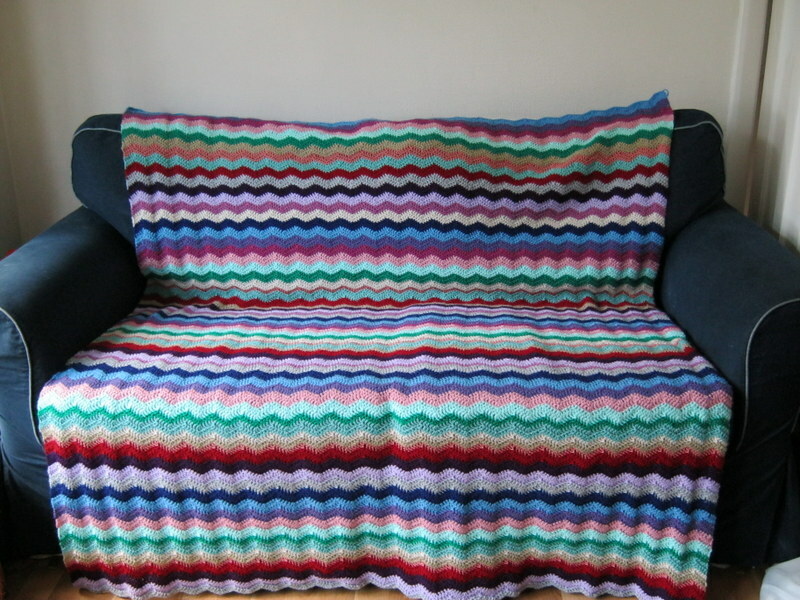 Anyway, back to the blanket, here it is: I used more colours than I think I’ve ever used in one project before! I wanted something bright and cheerful. Of course, half way through I decided I would have done it very differently but I’ve learnt so much in doing it, I’m really glad I carried on and finished it. I’m pleased with the over all effect. When I started I thought that I would like the colours to go in exactly the same order and do 2 rows of each but as the blanket progressed, I started to play with different colour combinations as well as throwing in just one line of colour here and there. Next time, I am definitely working the colours out on a sheet of paper first as well as playing with how to put the colours together (I’ve seen a lovely blanket that almost fades the new colour into the one you are working with). It’s all good fun!